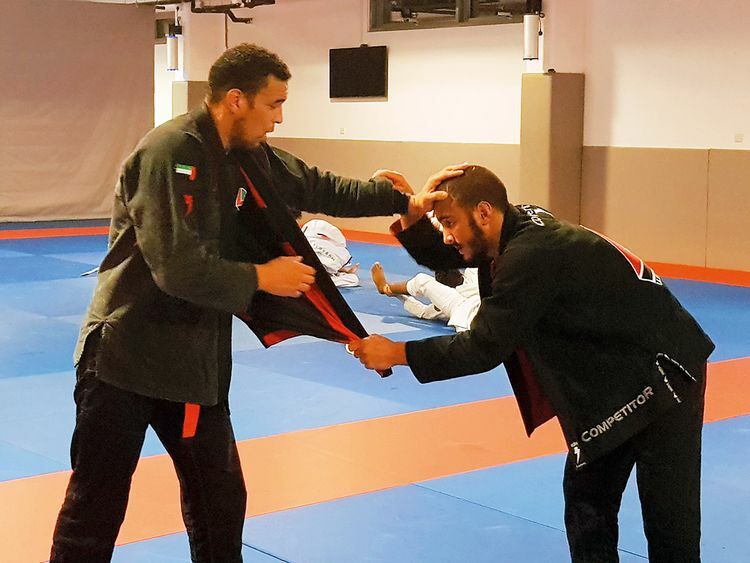 Abu Dhabi: With the World Professional Jiu-Jitsu Championship starting Saturday, the UAE top brass jiu-jitsukas are hard at work at the Mubadala Arena. But, away from the buzz in a closed room, two of the UAE’s best fighters — Faisal Al Ketbi and Hamad Nawad — are involved in a close combat. It’s all about fine-tuning things from now on and both medal prospects don’t want to leave any stone unturned in this regard. While senior pro Ketbi will be eyeing an elusive gold in the 84kg black belt category, UAE’s young jiu-jitsu sensation Nawad will be looking to defend his title in the blue belt 56kg category. Faisal [Al Ketbi]keeps sharing all his experience with me. I can see me take his place one day. Ever since Nawad won the 2018 Asian Games gold, he has been basking in glory on the personal front. The 18-year-old has become the first jiu-jitsu fighter to he handed a lucrative full sponsorship by Palm Sports, the technical arm of UAE Jiu-jitsu Federation. However, Nawad hasn’t been able to step on to the mat in a competition for six months now. It has been an agonising wait, as soon after Jakarta he had to undergo a long-pending surgery to fix his broken nose. “I had to put the surgery off for four years. There was always a risk of further damage, but Asian Games was important so I kept delaying the surgery,” said Nawad, who aims to be an army officer by joining the army college after high school. “I have started training just three weeks back, but I’m ready to defend my title,” declared Nawad, who attributed his success to his idol Ketbi who keeps pushing him to break the limits. “Last year, I could have taken part in the youth division as I was only 17, but Faisal, who I will say is my brother, pushed me to take part in the adult division. I won and that was a big boost for the Asian Games,” said Nawad, who in doing so, also replicated the same feat that Ketbi achieved in 2009 by becoming the first Emirati to clinch gold in the Abu Dhabi World Jiu-Jitsu Championship blue adults’ division. “When Faisal is fighting with me, he doesn’t care if I’m a kid and treats me like any other opponent. He comes hard at me and that’s what he wants me to do. “Obviously, he wants to make me better. He improved my skills in the takedowns, and he keeps sharing all his experience with me,” said Nawad adding that, his skills in the takedowns has improved immensely since training with Ketbi. “Faisal keeps sharing all his experience with me. I can see me take his place one day. We have all grown up watching him and want to be like him. It’s a long way to go, but I will be the next Ketbi,” asserted Nawad, who also was of the view that UAE has taken giant strides in the sport solely because of the support it has received from the UAE government. “We will very soon be having the best fighters coming out from here. In Brazil, there is no doubt the sport is popular, but they don’t have the support like what we have here and that will make a huge difference in the long run,” feels Nawad.